Over the years,extensive research has been conducted on Barnegat Bay but the work has not been fully coordinated - resulting in some key gaps in the data. The first step in filling this gap was to do an inventory of existing research and assess the conclusions of the various studies. This process resulted in the development of an extensive bibliography that catalogues ecological and land use studies performed on Barnegat Bay. Benthic or bottom-dwelling invertebrate insects are currently used by NJDEP in freshwater streams to show aquatic life impairment. This project will investigate the same scientifically defensible approach for estuaries using bottom invertebrate species (e.g., clams, worms, crabs, etc.) specifically to assess nutrient impairment from nitrogen and phosphorus in the overlying waters. 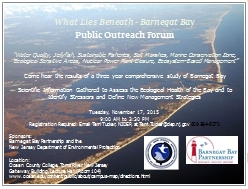 NJDEP water quality monitoring of Barnegat Bay for nutrients(nitrogen and phosphorus) did not start until 1989. Salt marsh sediments hold signatures of past nutrient loads going back hundreds of years as well as the remains of microscopic plant algae that can act as indicators of past pollution. 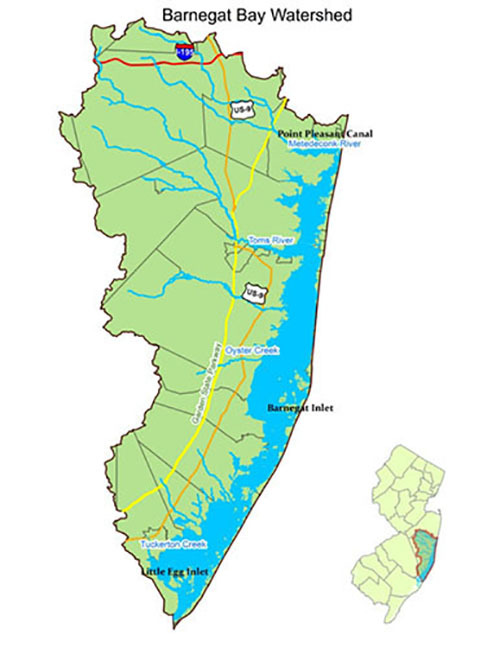 This information will be evaluated for the development of biologically-defensible nutrient criteria for New Jersey bays and related restoration goals. Assessment of Fishes and Crabs Responses to Human Alteration of Barnegat Bay. Fishes and crabs in Barnegat Bay are important natural resources, harvested both recreationally and commercially. However there have been no comprehensive studies of their populations since the 1970’s when increasing human density and urbanization occurred. The goal of this project is to determine how the fish and crabs of Barnegat Bay responded to this urbanization by comparing the temporal (annual, seasonal) and spatial (along the gradient of urbanization) variation in the bay. There has been an increase in the abundance and distribution of stinging jellyfishes in Barnegat Bay although very little is known about itscause. This study will investigate two possible drivers for this occurrence; increasedconstruction of hard surfaces (e.g., bulkheads, docks) that provide suitable attachmentsfor juvenile jellyfish and eutrophication from nutrients (e.g., nitrogen),which can cause a loss of oxygen giving jellyfish an advantage over otherspecies. In coastal bays phytoplankton are microscopic plants that float in the water column or live on the bottom forming the base of a complex food web. Algal blooms are often directly linked to nutrient loading that can cause fish kills and/or a reduction in some important fishery resources. This study will investigate the complex interactions between nutrient loadings,phytoplankton responses, and toxic/harmful algal blooms. Zooplankton includes shrimps, larval fishes, and other large animals in the water column such as jellyfish. They form an important food web link between phytoplankton algae and higher trophic levels such as crabs, shrimp, clams and fish. The last definitive studies of zooplankton in Barnegat Bay were conducted in the 1970’s. Many of the zooplankton are currently impinged ont he Oyster Creek Nuclear Generating Station cooling water intake screens or else entrained into the plant’s intake. New information will be needed on the abundance and distribution of these important ecological organisms as a baseline once the plant stops operating in a number of years. Historically, natural resource management within Barnegat Bay has occurred on a species (e.g., hard clam) or sector level (e.g., approved shellfish beds). Recently the principles of ecosystem-based management have given rise to more holistic management tools. The goal of this project is to develop dynamic models to help us understand how natural and human changes to Barnegat Bay have affected the structure and function of the bay’s biota and to determine how those components are linked and to predict how components will respond to management actions(e.g., reduced nutrients, clam/fish population recovery). Over 28% of Barnegat Bay's tidal marshes were lost to development between 1940 and 1970. However,recent studies show that wetlands in Barnegat Bay can adsorb and bury 80 % of the nitrogen entering it from upland sources buffering the waters from potential eutrophication effects (e.g., harmful algal blooms, anoxia, fish kills). Specifically,the study will enhance our understanding of the nitrogen uptake, burial and removal services provided by the coastal wetlands. The Sedge Island Wildlife Management Area in Barnegat Bay is located within NJ's first Marine Conservation Zone, just off Island Beach State Park.The shallow water surrounding the group of islands serves as a nursery for many species of marine animals including blue claw crabs, hard clams and fish. This study will assess the population structure and reproductive potential of blue crabs in the zone and compare them with crabs captured in more developed areas of Barnegat Bay. This will allow us to assess the effectiveness of the protected waters to sustain key recreational and commercially important species with the possibility of creating other low impact boating areas.